From left to right and from top to the bottom: Buildings at Avenida Carranza, Secretariat of Foreign Affairs tower, St. Louis Cathedral, National Institute of Statistics and Geography tower, Plaza de San Francisco, Museo Nacional de la Máscara, Calle Universidad, San Luis Potosí historical centre, panorama of San Luis Potosí. San Luis Potosí, commonly called SLP or simply San Luis, is the capital and the most populous city of the Mexican state of San Luis Potosí. The city lies at an elevation of 1,864 metres (6,115 feet). It has an estimated population of 824,229 in the city proper and a population of approximately 1,221,526 in its metropolitan area, formed with the neighbour city of Soledad de Graciano Sánchez and other surrounding municipalities, which makes the metropolitan area of Greater San Luis Potosí the eleventh largest in Mexico. The city is in the west-central part of the state of San Luis Potosí, at 22.16°N, 100.98°W. The municipality has an area of 1,443.14 square kilometres (557.20 square miles). It is part of the macroregion of Bajío. The city is named after Louis IX of France (also known in Mexico as San Luis Rey de Francia, Saint Louis, King of France), who is the city's patron saint. Potosí was added in reference to the fabulously rich mines of Potosí, Bolivia, discovered some forty years before the city was founded, as the exploitation of silver and gold mines in Cerro de San Pedro, near San Luis, was the main reason for the founding of the city in 1592. Besides its industry-based economy, recently the city has been promoted as a touristic destination in central Mexico by state and federal programs. San Luis Potosí's historic center displays a great mixture of different artistic styles in many buildings and is a major example of colonial architecture in Mexico. In 2010, the historic center was listed as a UNESCO World Heritage Site within Camino Real de Tierra Adentro. In pre-Hispanic times the territory now occupied by the state of San Luis Potosí included two cultural areas: Mesoamerica and Aridoamerica. While the south of the state was occupied by the Otomi kingdoms, its northern and central-west regions, where the city of San Luis now is located, were inhabited by Chichimeca. Chichimeca is a generic term given to various nomadic ethnicities which inhabited the northern fringes of the Aztec Empire which is now northern Mexico. As they were nomadic peoples they did not build large cities or have permanent settlements like most Mesoamerican civilizations. They are described by historians as very warlike peoples, living in continual wars among themselves. These tribes spoke different languages but their customs were similar. After the arrival of Spanish conquistadores into the territory now formed by the Mexican nation, it still took them about a century to colonize the northern territories in Aridoamerica. When the Spaniards founded the first settlements in the region in late 16th century, they had to struggle against constant attacks from Guachichil tribes. Extremely belligerent, these tribes attacked traders who traveled to Zacatecas in newly created routes. Conquistadores and religious missionaries called the place where San Luis now is located "El Gran Tunal" (Grand Place of Tuna fruit). Finally, in 1589, peace between Chichimeca peoples and Spanish settlers was reached thanks to efforts made by Miguel Caldera and Brother Diego de la Magdalena, which marked the end of the Chichimeca War. A Franciscan mission was established in the zone in 1583, nine years before the city's founding. In early 1592 the mines of Cerro de San Pedro were discovered. The lack of water in Cerro de San Pedro made impossible a new settlement in that specific area, as well as the proper exploitation of the minerals. A short distance away there was a valley where water was abundant. This originated the creation of a new township to facilitate the labors of mining extraction. The legal foundation of the town of San Luis Potosí was made in November 3, 1592, according to a charter commission raised by Viceroy Luis de Velasco and given to Miguel Caldera (considered the historic founder of the city) and Juan de Oñate. For a time in 1863, during the French invasion of Mexico, San Luis Potosí served as the capital of the republican government, under President Benito Juárez. The Plan of San Luis Potosí, issued November 20, 1910, was the opening shot of Mexico's revolution against the dictator Porfirio Díaz. The 1910 presidential election was stolen when Díaz had his opponent Francisco I. Madero arrested and imprisoned. Madero fled and issued the Plan of San Luis Potosí, declaring the election void and calling upon Mexicans to take up arms against the government. Today, the downtown is one of plazas and colonial architecture. The "Plaza de Armas" is the site of a cathedral and governor's palace (1770). The nearby "Templo de Nuestra Señora del Carmen," with its colorful-tiled domes and famous altars, is considered among Mexico's finest churches. In addition, San Luis is home to the bullring Plaza de Toros Fermin Rivera. Outside the center, a modern industrial city has begun to grow. The Universidad Autónoma de San Luis Potosí (UASLP) is in the city. Based on a Jesuit College founded in 1624, the Instituto Científico y Literario was raised to the category of a university in 1923, and is recognized as one of Latin America's best universities. San Luis Potosí features a semi-arid climate (BSh) under the Köppen climate classification. Its high altitude makes the city experiences only a handful of hot days each year. While the climate exhibits noticeably cooler (January and February) and warmer periods (April and May) of the year, temperatures are relatively consistent throughout the course of the year. San Luis Potosí receives, on average, 392.1 mm (15.44 in) of precipitation annually, mostly seen from May through October. Snowfall is a rare occurrence. The last recorded snowfalls occurred on January 1967, December 13, 1997, December 2011, March 2016, and December 8, 2017. Potosinos (as residents of the city are referred to) are proud of their bright orange enchiladas potosinas, often served fried with refried beans and guacamole. The nearby town of Santa María del Río provides the state with its sparkling mineral water, Agua de Lourdes. The water fills both store shelves and the cocktails of Potosinos, who claim the water can cure a hangover. 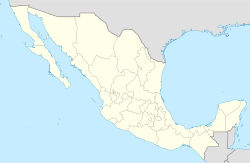 With a population of approximately one million inhabitants, it is now the tenth-largest metropolitan area in Mexico. The city is a major commercial and industrial center. It lies in an economically advantageous area at the heart of the "triangle" formed by the three largest cities in Mexico: Mexico City, Guadalajara and Monterrey. In recent years, the city has attracted the attention of European and American investors; its political, social, and economic stability has convinced large multinational companies to assume a presence there and to buy land, on the outskirts of the city. Recently, according to a survey conducted by the magazine The Investor, San Luis Potosí and its metropolitan area was the third-best place to live in Mexico. The city has experienced one of the fastest increases in demand for housing. Besides having hundreds of classically designed buildings, the city is also home to some of the most modern and interesting buildings in Mexico. In recent years the city has faced a boom in the construction of buildings and museums. Among the most prominent are the Laberinto Museum of Science and Arts, which was an investment of more than $200 million pesos, in 9000 m2 of land in the Tangamanga I Park. The project was designed by architect Ricardo Legorreta and promoted by the governor of San Luis Potosí, Marcelo de los Santos Fraga. It is a museum of aesthetic proportions similar to that of the Papalote Museum of Children in Mexico City, with the addition that the materials used in its construction, especially the quarry, make it a real Potosino manufacturing building. The floor of the museum occupies a total of 6.5 ha, which have gardens with species endemic to the region and a central source. Its interior is divided into a total of six rooms arranged in galleries. Their proportions will allow visitors to make an interactive tour that will switch themes of the art museum with samples of science and technology. Currently, the two tallest buildings in the city are the EME Building and the Muniz Werger Building. The EME Building was built in 1988 and measures 64 m to the top floor, with the spiral 75 m, with the antenna 98 meters. It has 17 floors, with 10 levels of parking at the street for a capacity of 1500 cars, and it houses mixed offices. The Muniz Werger Building, which measures 58 m for the top floor, 65 m with the spiral, and 80 m with the antenna, has 15 storeys and 2 elevators. Its construction began in 1991 and finished in 1993 and it is considered the most modern building in the city. There are currently two buildings under construction and five buildings in the project. Corporate Tangamanga, which measured 41 m, will have 14 floors; its construction began in 2005 and will end in 2008. This building houses offices and mixed Star Medical Tower, 40 m and will have 8 floors. Various supermarket chains operate in the city, such as, H-E-B, Commercial Mexicana, Costco, Walmex (Wal-mart, Sam's Club, Superama, Vips, Bodega Aurrera and Suburbia), Chedraui, and Home Depot. The principal commercial centers of the city are Plaza Tangamanga, Plaza el Dorado, Plaza Sendero, Plaza Citadella and Plaza San Luis. In the city, various banks also operate, such as, BBVA Bancomer, Banamex, HSBC, Banorte, Santander-Serfin, Actinver, Scotiabank-Inverlat, and BanRegio. The city's transportation consists of a public system, based on urban buses that move throughout the metropolitan area. Besides, the city contains one of the highest concentrations of taxis. Ponciano Arriaga International Airport is the city's main airway point. It is around 17 km (11 mi) from the city's downtown and it is the state's most important airway terminal. IPICYT, UASLP and El Colegio de San Luis are also world class research institutions that offer doctoral degrees. Newspapers include El Sol de San Luis, Pulso, El Heraldo de San Luis, La Prensa, San Luis Hoy, La Jornada San Luis, and Tribuna. ^ "Entrada Group: at the heart of Mexico's thriving manufacturing industry". ^ Méndez, Karla Ruiz. "Se afianza en el Bajío clúster de autopartes". Periódico am. ^ "Historia de la Ciudad". Archived from the original on 23 November 2010. Retrieved 15 March 2011. ^ "San Luis Potosí polo de desarrollo industrial en el centro del país". Archived from the original on 30 August 2007. Retrieved 15 March 2011. ^ "Camino Real de Tierra Adentro". Retrieved 15 March 2011. ^ a b "Época prehispánica". Archived from the original on 22 July 2011. Retrieved 15 March 2011. ^ Peralta Merino, Atilio Alberto. "La guerra Chichimeca". Archived from the original on 3 May 2011. Retrieved 15 March 2011. ^ "Fundación del pueblo de San Luis Potosí". Retrieved 15 March 2011. ^ "Estado de San Luis Potosi–Estacion: San Luis Potosi (DGE)". NORMALES CLIMATOLÓGICAS 1951–2010 (in Spanish). Servicio Meteorológico National. Archived from the original on 9 July 2015. Retrieved 6 May 2015. ^ "Extreme Temperatures and Precipitation for San Luis Potosi 1949–2010" (in Spanish). Servicio Meteorológico Nacional. Archived from the original on 9 July 2015. Retrieved 6 May 2015. ^ "NORMALES CLIMATOLÓGICAS 1981–2000" (PDF) (in Spanish). Servicio Meteorológico Nacional. Archived from the original (PDF) on 3 March 2016. Retrieved 6 May 2015. ^ "Station 76539 San Luis Potosi, SLP". Global station data 1961–1990—Sunshine Duration. Deutscher Wetterdienst. Retrieved 3 May 2015. ^ "Ciudades Hermanas de San Luis Potosí". Archived from the original on 23 November 2007. Retrieved 15 March 2011. ^ "Semana Santa en San Luis Potosi". www.visitmexico.com. Wikivoyage has a travel guide for San Luis Potosi. This page was last edited on 13 February 2019, at 03:27 (UTC).